Cram us into cities, spread us out in the suburbs, scatter us in the country, disperse us as you will; humans are nonetheless at heart a lonely species. We are smart enough to cauterize our solitude with society, but there's a part of every man, woman or child that is aware of our spectral nature. We know we are haunted, and that when we reach out we catch — at best — the ghosts of those around us. 'A Certain Slant of Light' collects five previously published stories and three originals in a very nice package. Paul Lowe illustrates each story with sparse pencil visions that are moody and suggestive. Publisher Robert Morgan's sans-DJ volume has the feel of a volume you might find in the library frequented by one of Peter Bell's characters. Before you can even read a word, a spell is cast. Bell's stories live up to the classy presentation. "Lamia" offers up a richly textured scholarly twist on the "spend a night in this house" genre. In a nicely paced short story, we get the rich detail a longer piece. In "Bewitched" young Philip ignores neighborhood wisdom to his own peril, and receives the sort of gift one wishes to, but cannot, return. Here, Bell takes on another familiar horror trope, and brings his sense of pacing and prose to craft a low-key, disturbing vision. "Millennium Ball" finds Kent pending his vacation with an old college friend on the Isle of Coll. Isolation does not serve him well, other than to those who have decidedly unhealthy plans in store. "Conservation" presents Natasha with an urban architectural puzzle that is best left unsolved. Bell's evocation of the unsettling nature of a space in a crowded city is superb. "The Barony at Rødal" brings forth shapeshifter by way of the past reaching into a present-day tour of Norway. As with all the stories in this book, there's a lot to unpack here, pleasurable details that cling to the reader's discomfort long after the story is finished. "Merfield House" makes explicit the ghost hovering over this collection, that is M. R. James. Caroline Caulker makes, as often happens in life and more so to the unfortunates who character Bell's stories, an unfortunate decision. In her case, it involves researching and then reading a manuscript. Here, Bell's ability to manufacture scholarship, to haunt his readers with the imagined knowledge they might unhappily possess, is well served by his ability to craft the prose of others. | In "Archangel," Marcus explores a church, and in Peter Bell's visionary prose, that results in an experience that is delightful for the reader, but not so much for Marcus. The final story in the collection is "Only Sleeping," which of course, is not the case with regards to the subtle terrors that await Robert on his return to the boarding house on the Isle of Man. In the "Afterword," Bell alludes to the influence of M. R. James on the stories in this book, and discusses each story in this regard. But influence only goes so far; Bell's work bears his own unique stamp, in particular prose that captures numinous detail and protagonists who feel authentically weary of the pace of their own lives, however fast or slow that may be. 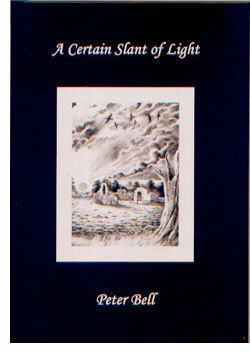 Peter Bell's stories in 'A Certain Slant of Light' capture the mood that wraps us when we are alone, and feeling less than happy. It isn't sorrow, but a regret as to the things we do not know but would hope to learn, and those we find within and are unable to forget.